With the help of science teacher Brad Warrick (US’90, C’94), the students note the various types of swifts, swallows, pelicans, and hawks. Later, as they clamber back on the bus, there’s some good-natured bantering about who has seen more of what kind of bird. “I saw a new bird this morning,” one student gloats. “Nyah, nyah, nyah—well, I’ve seen an American coot,” retorts another. “I’m starting to dream about birds,” sighs a third. “How do you tell the difference between a greater yellowlegs and a lesser yellowlegs?” asks a curious seventh grader. “Mr. Warrick, if you see a cedar waxwing, will you take us to see it on Saturday?” pleads an eighth grader. The course description for the ornithology class comes with a warning: “Be prepared for early morning bird walks!” But the prospect of having to be at school by 6:30 a.m. on a Saturday has not deterred these students—nor others who join these bird walks even though they’re not in the class. Currently, 27 seventh and eighth graders are enrolled in the two sections of the class. Students are expected to learn how to identify at least four new birds each day, and they have to know 20 different birdcalls. They also enjoy developing their sense of competition, spurred by the requirement to record their sightings through a website called eBird. Launched in 2002 by Cornell University and the National Audubon Society, eBird essentially harnesses “crowdsourcing” to gather a rich database of bird distribution and abundance throughout the Americas and beyond. An avid birder since being introduced to ornithology by former Upper School biology teacher Ted Munnecke (C’57), Warrick has studied birdlife in more than 30 countries. He is ranked in the top 10 in Missouri for the number of bird species sightings he has reported on eBird. Nearly as impressive, brothers Garrett (sixth grade) and Dylan (ninth grade) Sheets are also currently in the top 10. 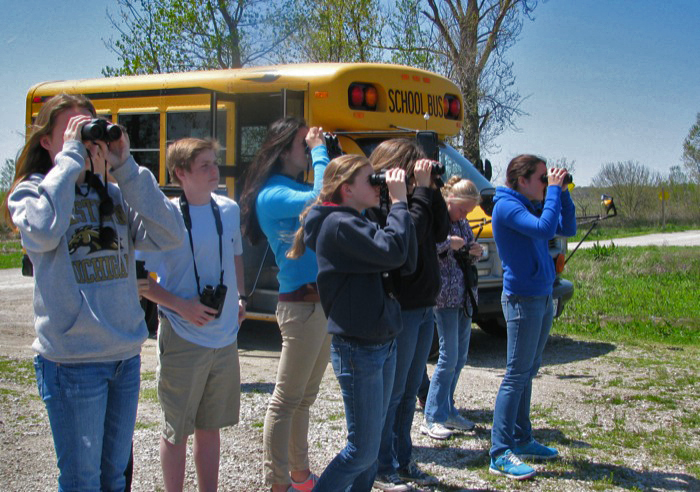 They have been birding with their parents for some years—and the goal of several students who are just being introduced to birds through Warrick’s class is to see if they can catch up.